CES 2017 saw further validation of the distributed Wi-Fi system (DWS) architecture introduced to the consumer market last year by eero, Luma and others. NETGEAR was the first encumbent Wi-Fi vendor to join the fray with its not-really-mesh Orbi. And CES 2017 saw Linksys join in with its oddly-named Velop Whole Home Mesh Wi-Fi system. Velop's key difference from other "three-pack" DWS systems is its addition of a second 5 GHz radio. This makes it the first distributed Wi-Fi system with a second 2x2 5 GHz radio. But Linksys has chosen to not dedicate either of the 5 GHz radios to backhaul duties. We found during testing that clients could connect to either 5 GHz low band (36 - 48) or high band (149 - 165) channels. Learn more about the difference in DWS products. Velop's makers chose a mini-tower format for the system's nodes. The attractive (slightly over) 7" columns morph from a square at the top to a rounded square on the bottom, giving it an approximately 3" x 3" footprint. There's single LED embedded into the top that changes colors as noted in the callout diagram below. Ample ventilation is provided by holes on the top and on the side of the device. There are also vent slots hidden away in the bottom of the tower. But they are likely to not be of much use since air access is via the small cable raceway that will be partically blocked by cables. All connections are on the bottom as shown in the callout diagram below. The flexible raceway at the back corner of the Velop tower is just big enough to accommodate two Ethernet and one power cable. The two Gigabit Ethernet ports are not functionally dedicated. Velop will figure out whether you want the port to function as WAN, LAN or wireless bridge. Velop can use Ethernet as backhaul, but this option isn't part of the current setup wizard. Just set everything up first using wireless backhaul, then connect the desired nodes to Ethernet. 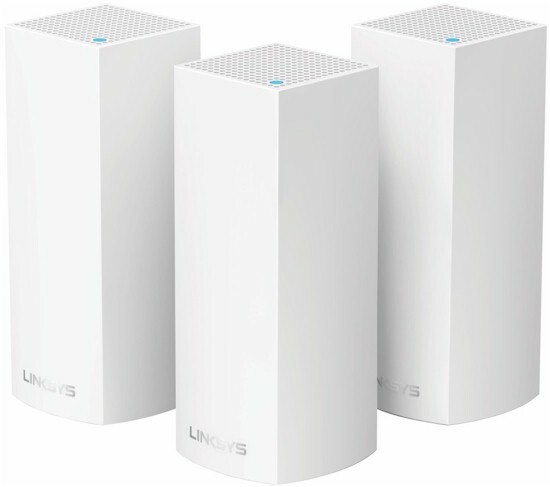 Linksys has list-priced Velop right up there with eero at $500 for a three-pack, so it ain't cheap. Linksys may be counting on Velop's three radios vs. eero's two to get buyers to put Velop in their carts. You can also buy Velop one at a time and pay $200 each for the privilege. Velop's FCC documents are under wraps for awhile. So when testing was done, I opened one up for photos and component identification. Velop's designers did not make this easy, although after not-so-gently prying it open, I found well-hidden screws that could have made the process easier. That said, I won't be putting the sacrificial Velop back together anytime soon. Let's first get one thing straight: Velop is not an "AC4400" or "AC6600" system as found in fine print on the product box and listed on Amazon since being first posted and which Linksys has failed to correct. A Velop AP has three 2x2 radios, one 2.4 GHz and two 5 GHz, all of which support 256-QAM link rates. So the class rating math is 867 Mbps + 867 Mbps + 400 Mbps = 2134 Mbps, which is naturally rounded up to 2200. In other words, this is a 2x2 AC1300 class AP with a second 2x2 5 GHz radio. In other words, Velop has the same basic design as eero, Luma and Google Wifi except it has a second 5 GHz radio. The first panel shows the rear panel pried off to reveal the antenna for the undocumented (and non-functional) ZigBee radio. You're also seeing the combination of a black heatsink that covers one side of the main board and a plastic frame covering it. Two dual-band and two single-band 5 GHz antennas sit in a plastic frame at the top of Velop (photo left). The next view shows the heatsink and RF can tops stripped away to show the quad-core Qualcomm IPQ4019 wireless SoC, QCA 8072 Gigabit switch, 4 GB flash module and the 2.4 and 5 GHz radios that share a pair of dual-band antennas. The other side of the board holds the 512 MB of RAM and QCA9886 2x2 radio for the second 5 GHz radio that has its own pair of antennas. The white cable at the bottom of the photo connects to a separate board containing the Bluetooth and ZigBee radios. The component summary below shows the key components for Velop, Google Wifi, Luma and eero. The gallery below has some more inside photos and commentary. The second 5 GHz radio and system RAM sit below this heatsink. Most components are under this heatsink. View of the ZigBee and Bluetooth radio board. The Bluetooth antenna is in the top section, sitting behind the right front Velop side. With RF can tops off, the Silicon Labs EM3581 ZigBee SoC and SiGe power amplifier are clearly seen. The Bluetooth radio markings were too tiny to read the part number. View of the four antennas and LED module. The dual-band antennas are marked R and L.
One of single-band 5 GHz antennas sits almost 1/2 inch below the other.